CD review: "Friday Afternoon in the Universe"
This review first appeared in the February 3, 1995 issue of the North County Blade-Citizen (now North County Times). 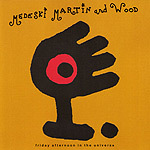 Medeski Martin and Wood play a hip brand of jazz that is avant garde, funky and exciting. This is the kind of music Frank Zappa used to put out during his better moments  on-the-edge (sometimes over) fusion with a sense of adventure and fun. While 1993's "It's a Jungle in Here" featured a backing horn section, the band returns to a pure trio (keyboards, bass, drums) format on this latest outing. The stripped-down instrumentation gives the music a tighter sound  a sound that seems to maintain its focus better. John Medeski (a veteran of the Either/Orchestra, a little-known but highly regarded by those familiar with it avant garde big band) has a wide range on keyboards, but Jimmy Smith-influenced blues on a cover of Duke Ellington's "Chinoiserie" to hte straight-ahead Wurlitzer on "Last Chance to Dance Trance (Perhaps)." Drummer Billy Martin can swing like a big-band veteran, or lay down a frenetic rock beat the envy of any punker. Chris Wood's bass playing is always funky, and the arrangements give him nearly equaly lead and solo time with Medeski. The band wrote most of the songs here, and nearly all are interesting. It's definitely an album worth getting if you're into the farther edges of jazz.